The sixth episode of Fangirls Going Rogue was an adventure through fandom. Tricia and Teresa shared their exciting trips to Lucasfilm and SXSW, respectively, then started planning their next great adventure together at Star Wars Weekends this summer. Mark Hamill has been announced for Week IV in June, but starting May the Fourth you can dine with Star Wars characters in one of two dining experiences at Hollywood Studios. Next month’s episode will have more tips and tricks for Star Wars Weekends. Don’t forget RebelForce Radio will be hitting the event on Week II (May 23-25). While Teresa rocked her Rogues fashion on a trip to Disney, Ashley Eckstein announced a fashion show that will be hosted by Her Universe at San Diego Comic-Con. This is a chance for fans to become designers, so get out your sketchbook and scissors and start creating. When we dove into the things we are looking forward to, Her Universe’s unannounced line for Star Wars Weekends topped Teresa’s list. Tricia’s copy of The Empire Striketh Back from Quirk Books had just arrived and she was eager to dive in. The discussion was inspired by a post on Star Wars Books Facebook page. Feel free to share what you’re looking forward to either in voicemail, email or social media. It wouldn’t be an episode of Fangirls Going Rogue if the ladies didn’t pitch a story idea. After discussing some of the “upsets” in StarWars.com’s This Is Madness bracket challenge, Tricia wondered why there were nohandmaidens. That turned into a conversation about handmaidens as the protagonists of secret operative adventure stories in the vein of James Bond. Tricia dug out some Prequel Trilogy era RPG reference books. Check out Secrets of Naboo for all the cool abilities attributed to the handmaidens. In The Force Unleashed Campaign Guide, it is revealed that Sabé traveled the galaxy as a Rebel recruiter and also trained Leia and Winter. There would be a great opportunity to work her character into Star Wars Rebels as we see the Rebellion picking up steam. The fangirls took some time to shout-outs their favorite podcasts. What Tricia and Teresa couldn’t manage was the name of “that guy on That 70’s Show…” Recently, the RebelForce Radio Clone Wars Declassified have been revived to explore The Lost Missions. Tricia appeared on this week to discuss “The Disappeared.” On the main show, Dave Filoni sat down with Jimmy Mac and shared insights on the final The Clone Wars season. Also, the fangirls recommend the movie commentaries with Sam Witwer. Pop in the DVD or Blu-Ray and enjoy Star Wars in a new way. Some other favorites include Coffee With Kenobi, 1138 Radio, Star Wars Report, and Full of Sith. Oh, and that name is Topher Grace! Dr. Andrea Letamendi has a Ph.D. in Clinical Psychology and has spoken about psychology and comic books, science fiction, and fantasy at conventions such as San Diego Comic-Con, WonderCon, and New York Comic Con. Star Wars fans have heard her on Full of Sith and Coffee With Kenobi. She has been interviewed by The Huffington Post, CNN.com, Psychology Today, UCLA Magazine, Badass Digest, andWired.com. Additionally, Dr. Letamendi’s work has been featured on The Hollywood Reporter, Yahoo News, and The Mary Sue. Tricia and Teresa discussed with Drea a wide range of topics, from becoming a fangirl, the similarities between Darth Vader and Batman, and how fandom reacts to new fans. Drea will be appearing on several panels at Wondercon this weekend, including The Psychology of Star Trek vs Star Wars (with Catherine Taber and Chase Masterson), Batgirl Begins Again (with Gail Simone), and Multicultural Heroes in Comics. Check out Drea’s website Under The Mask for more information. You can find her on Twitter@ArkhamAsylumDoc. 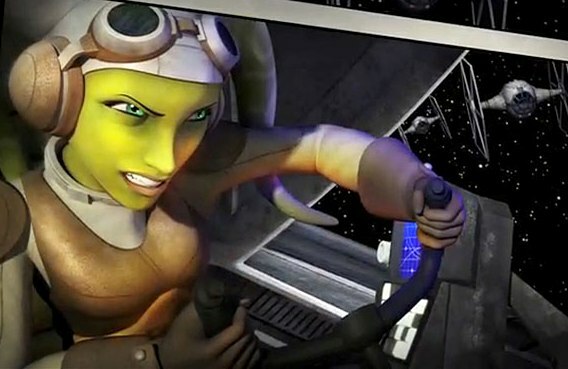 This month’s character discussion was a no-brainer: Hera Syndulla from Star Wars Rebels. Fans may not know a lot about this character, but there is enough potential to get really excited for her future in Star Wars. She’s a pilot, the owner of the Ghost, and voiced by enthusiastic fangirl Vanessa Marshall. If you haven’t read the interview with Vanessa at Newsarama, check it out! If you’re curious what else Teresa and Tricia have to say about Sabine, Kanan, and Star Wars Rebels, check out our Youtube channel, Fangirl Chat. Please go like RebelForce Radio on iTunes and leave a positive review, and in your review mention how much you like Fangirls Going Rogue.